CERCA is a Living-Learning Environment Catering to Students! We want your college student to be successful throughout their career at SDSU. They need a good foundation and support to gain this success. At CERCA, we want to help support their productivity by giving them a fully-equipped computer lab and individual study rooms. And, we want them to feel at home. We offer private rooms, in-unit kitchens and laundry, modern furnishings, and 24-hour emergency maintenance. CERCA will provide your student with a home away from home, while they are pursuing academic success at SDSU. Individual leasing means peace of mind for you. Your financial responsibility is only for your student’s space unlike many apartments or rental houses where a joint lease is required. 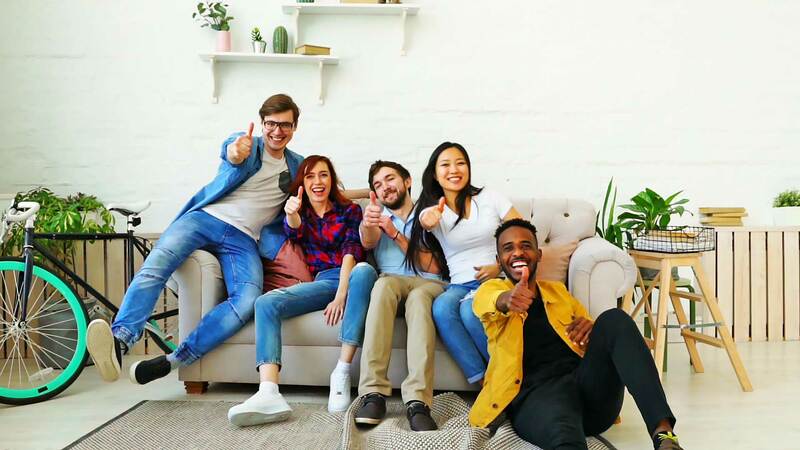 If a roommate transfers to another school or moves out of CERCA for any reason, you do not have to worry about having to cover their portion of rent. This is just another reason why CERCA is your student’s best housing option! Our maintenance staff will respond to your student’s maintenance issues quickly and professionally. CERCA offers 24-hour emergency maintenance and your student’s comfort always will be our priority. CERCA has five spacious floor plan options. We offer 3×2 and 4×2 apartment homes. Whether single or shared, each bedroom is private, locking, and has easy in-unit full bath access. Each apartment at CERCA includes a furnished living area with a comfortable couch, chair, coffee table, end table and a 42″ TV. The kitchen comes fully-equipped with energy efficient appliances, a refrigerator, dishwasher, and each unit includes a laundry area with full size washer & dryer. Bedrooms are equipped with either a full-size or twin XL bed and an end table. If your student is not matched with a roommate, we can help. Through our extensive roommate matching service we can make suggestions based on their lifestyle preferences, study and sleep habits, and other variables. Not only will we find a suitable roommate, we’ve also been known to find life-long friends. At CERCA, our staff plans monthly resident social events for fun and networking opportunities. These events range from pizza parties to grocery bingo, from résumé building classes to gaming tournaments. We also keep our residents connected to SDSU-sponsored events, as well as events happening around town so they don’t miss a thing! We want your student to succeed academically as well as socially! CERCA rent includes: utilities (water, sewer and trash pickup), cable, internet, full size washer and dryer, access to all of CERCA’s amenities and a full-service staff including 24-hour maintenance. Rent is paid according to an installment plan. You may choose one installment, two installments, or twelve installments. If you choose to pay a single installment for the entire amount due, that single installment payment is due August 1. If you choose to pay in two semester installments, those installments are due August 1 and January 1. If you choose to pay in twelve installments, the first installment is due on August 1 and the remaining eleven installments are due on the 1st of the next eleven months. Please note that these are all installment payment options and not monthly rent. At CERCA we offer multiple ways for you to apply your installment payments. You can pay in the office with a personal check, or certified funds like a money order or cashier’s check. You may also pay online through the Resident Portal (service & convenience fees apply). Most financial institutions also offer automatic bill pay. Check with yours to see if it does. We do not allow pets at CERCA. Does my lease provide coverage for my belongings? CERCA’s insurance will not cover your personal belongings in the event of a fire, theft or natural disaster. We require Renter’s Insurance for this reason. If a resident has not provided proof of insurance, they will automatically be enrolled in our Tenant Limited Liability Program and charged a monthly fee to cover this cost. CERCA’s lease is binding and cannot be broken. If you cannot live at CERCA after signing your lease, you will need to re-let. Please call the leasing office for information on re-letting. If you need maintenance, simply go to your Resident Portal on our website or the ResidentPortal app on your phone and fill out a maintenance request. You may also call or visit the front desk. If it is an emergency, please notify the front office immediately. Any decorations or personal belongings to make your new room feel like home! What kinds of events do you have at CERCA? At CERCA, our staff plans monthly resident social events for fun and networking opportunities. These events range from pizza parties to grocery bingo, from résumé building classes to gaming tournaments. We also keep our residents connected to SDSU-sponsored events, as well as events happening around town so they don’t miss a thing! Fall ’19 spots are going fast. Secure your housing for next year TODAY!